Back in the far off year of 2002 a series by the name of Beet The Vandel Buster was published in Monthly Shonen Jump by writer/artist duo Riku Sanjo and Koji Inada. The series follows the titular Beet as he aspires to be a Buster, a sort of high-class mercenary, and put an end to the Dark Age of the Vandels, a race of demon like creatures that rule over the majority of the world. On his first day as a Buster, Beet witnesses his childhood heroes, The Zenon Warriors, taking on a particularly powerful Vandel. Just as it seems that the Zenon Warriors have the Vandel on the ropes, Beet yells out in excitement, catching the attention of the Vandel who then proceeds to mortally wound the young boy. In order to save his life the five Busters give Beet each of their Saiga, a magical weapon construct connected to ones own soul. In doing so they successfully pass on their greatest power to the boy, saving his life, but in the process leaving them defenseless against the Vandel. As the Busters charge into battle Beet loses consciousness only to find both the Zenon Warriors and the Vandel gone without a trace when he awakes. From that moment on Beet assigns himself the task of wiping out all of the Vandels and ridding the world of its Dark Age. Riku Sanjo is at his best in this open world fantasy adventure and shows just how far he had come since the duo’s previous work, Dai no Daiboken. While the story and setting are simple and very Shonen they are done near flawlessly. 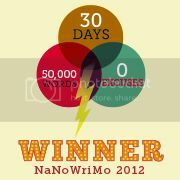 Each character is given plenty of room to grow with no one feeling too particularly overshadowed. Of course this is a story about Beet and as such he gets the bulk of the shining moments within the series. That said it never feels as if it’s too much of a hindrance on any of the other characters and Beet himself manages to show off legitimate development for all of the time that he’s given. Beet aside the supporting cast is wonderfully entertaining, with each character having distinct and fun personalities. Even the Vandels themselves each manage to have an impressive amount of characterization, be it the quirky minor villains or the surprisingly interesting, and sometimes rather intense, big bads. Surrounding the characters is an impressively fleshed out world for that of a battle manga, and an intriguing one to boot. Every facet of the world functions similar to that of a fantasy roleplaying game, with such things as the Busters and Vandels gaining levels, videogame-esque economies, and even power-up modes for each of the Saiga. The reason behind this choice seems to be entirely for appeal as the world itself is not actually supposed to be looked at as a game, but rather just game-like. That said, it all works fairly well and helps to showcase the growth in strength of each of the characters through visualized leveling. Whether more was meant to be done with this style of world was unfortunately never able to be seen as the series went on an indefinite hiatus in 2006, leaving the story without a conclusion. Being a monthly series the art feels very polished and manages to increase in quality as the series progresses. While, like the story, the art is simple, Inada’s work matches up very well with the story, world and characters laid out by Sanjo. The design of the characters falls in line with the game-like theme of the world with the main characters looking very much like your typical cool RPG-esque heroes and the villains taking on a sleeker and, of course, demonic design akin to that of a Dragon Quest game. Which is fitting given the duo’s previous work, as mentioned earlier. The overall aesthetic to the series is a fairly lighthearted one, with the human characters looking quite animated and the Vandels looking more “cool” than monstrous or grotesque. The series has an obvious look of wanting to be more fun and adventurous as opposed to taking a more serious tone. That said, both the art and the writing manage to hit a suitable dreariness when dealing with a more somber or ominous moment, while at the same time going just as big and bombastic as necessary for its fight scenes. As mentioned earlier, Beet The Vandal Buster is unfortunately an unfinished series with it only making it about four years into its publication. 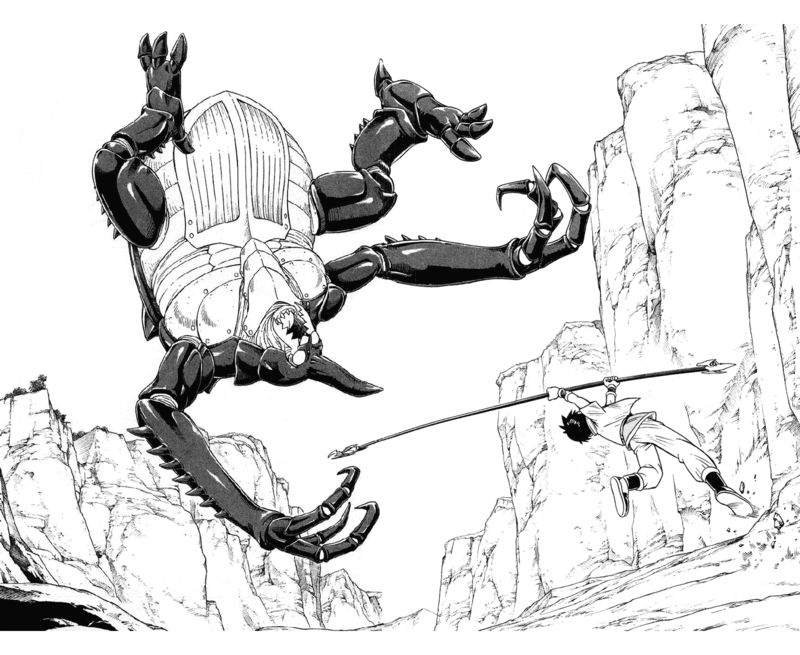 The series had originally gone on hiatus following artist, Koji Inada’s, sudden illness. A mere six months later Monthly Shonen Jump had announced that the magazine itself would cease publication with an alternate magazine, Jump SQ, taking its place. Since the end of Monthly Shonen Jump, writer Riku Sanjo, has gone on to do work for the Toei Company, writing for several of its television shows, such as Kamen Rider W and Jyuden Sentai Kyoryuger. To date, Inada has continued to remain out of the public eye with it being uncertain as to his current physical condition. While Beet The Vandel Buster seems to be in a never ending limbo it is, regardless, a series worthy of attention. For what it does, be it simple or not, it does it near flawlessly. The team of Sanjo and Inada proves to be an effective one and each manage to compliment the others’ talents very well. It is a series that pretty much exemplifies a shonen battle manga and is worth a look, ending or not. 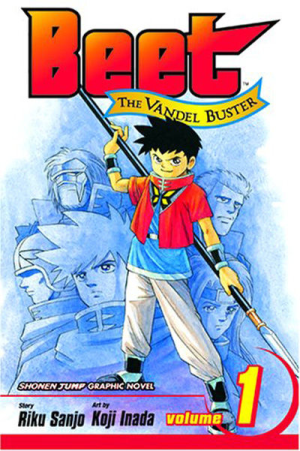 Beet The Vandel Buster is available in English by Viz Media having been fully released in a healthy twelve volumes. No digital copies are currently available. There is also an anime for those who are so bold! Produced by Toei animation, it ran for two seasons for a grand total of 77 episodes. The series was licensed by Illumination Entertainment in North America, but only saw a single DVD release covering about four episodes. This has been Lets Manga!, a brand new series with a stupid title that I have been working on for a fair amount of time. If you have any criticisms or suggestions then feel free to blurt them out as you will. Lets see if we manage to do this again sometime. Until then, bye bye!